I hope everyone has had a wonderful summer with their families and friends - it’s hard to believe school starts this week but I know we are going to have another great year at BCIG Elementary! Donate a kids book that you no longer use to our new Free Library Book house. If there is a different book in the Free Library that you are interested in reading you can take it home with you tomorrow. We are looking for books from all grades so please check your house for any books starting to collect dust and bring them in. We will share more information about the Free Library Book House in our PTP welcome email but we thought it would be fun to show everyone at open house what the Free Library is before installing it outside the school. Recycle any old crayons or markers from the summer. 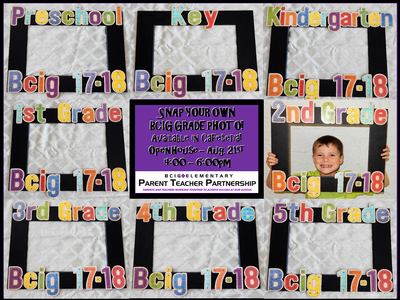 Snap your own grade photo frames will be available in the cafeteria. Enjoy a sugar cookie donated by our PTP group. 1. BCIG PTP PENNY DRIVE - our November fundraiser was a big success and our school raised $1,053.12 for our PTP program!! We will be giving prizes to the top 3 classrooms as a thank you for bringing in so many pennies! 1st prize - MRS. EHRIG'S classroom - Pizza Party! 2nd prize - MRS. GLAWE'S classroom - Sugar Cookies! 3rd prize - MS. ANDREW'S classroom - Ice Cream Treat! THANK YOU to everyone for your support with this fundraiser... every penny counts and they sure add up! Thank you to Tashia Uken and Amy Godbersen for collecting the pennies and taking them to United Bank of Iowa to be counted last week. WE'VE GOT SPIRIT, YES WE DO! WE'VE GOT SPIRIT HOW ABOUT YOU!?!?!? HOMECOMING 2015 SPIRIT TABLE - the BCIG PTP made a profit of $508.58 this year - AWESOME!! THANK YOU to everyone who helped support this table in so many ways - donating an item, donating $$ towards the purchase of items, working the Spirit Table (Kaylene Henningsen, Karen Gunderson, Maggie Buns, Jessica Oldham, Heather Sweeden, Jodi Lansink, Jamie Corbin, Kathi Johnson & Angie Quirk from OA), and also to everyone who came and purchased our Falcons/Spirit Items at the table last Friday!! The BCIG PTP and the OA PTCP had a lot of fun working together for the Homecoming Spirit Table at the football game! Thank you to the following people who donated money towards the PTP purchasing footballs, seat cushions, tattoos, smudges, and Falcons sugar cookies: Sarah Harm, Amy Forbes, Brandi Sharkey, Jodi Lansink, Jaci Nichols, Megan Nicholson, Laura Parks, and Amy Godbersen. Thank you to the following for your product donations to the Spirit Table: Maggie Buns (Bam Bams) and Heather Messing (Colored Hair Spray). * HOMECOMING PICTURE FRAME W/ FOOTBALL PROPS - pom poms, boas, sunglasses, footballs, football photo sticks, & more. We have 2 sizes of picture frames... the largest one can easily fit 2 kids, maybe 3!! The cost of the picture is $1...snap your own photo! Thanks to Kathi Johnson for the great idea! * GAME TIME SPIRIT - colored hair spray in 3 colors, football smudges & tattoos. Each item will cost $1 and we will apply it for you at the Spirit Table! * SPIRIT ITEMS FOR SALE - OABCIG Falcons Footballs, OABCIG Falcons Bracelets, Falcons Football Sugar Cookies, Girls Falcons Hair Ties, Purple Seat Cushions, Purple Bam Bams, Glow Sticks & Bracelets, Purple & Black Pom Poms, Purple Sunglasses, Candy Grab Bags, and Spirit Grab Bags! * FALCONS RAFFLE DRAWING - we are excited to have a Falcons raffle drawing at the football game! We have some great Falcons spirited items for the drawing! $1 per raffle ticket. Thanks to Maggie Buns for the great idea! BCIG Elementary hosted Open House next Thursday, August 20th from 4:00 - 6:00pm. The BCIG PTP served over 550 cookies & juice in the lobby as well as giving each student a BCIG Falcons pencil ! Thank you to Megan Nicholson for designing these pencils! 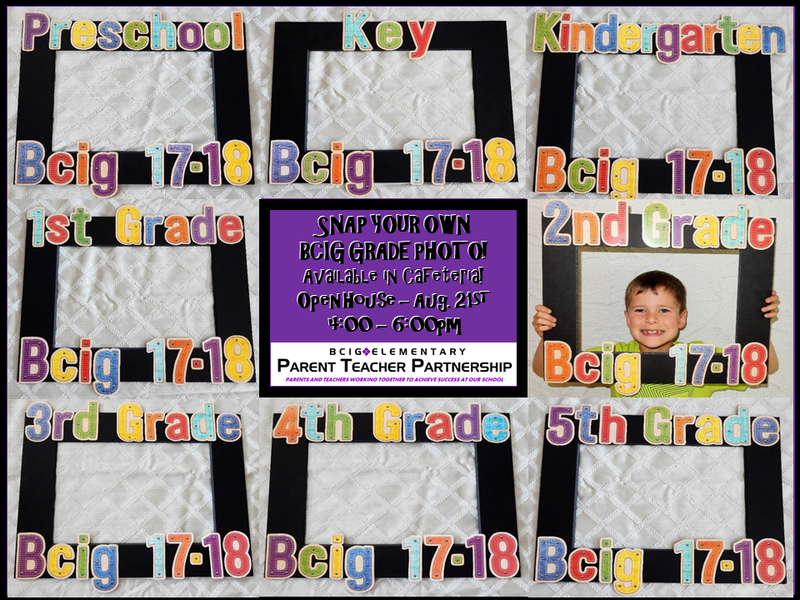 The BCIG PTP also had 2015-16 Grade Picture Frames available for parents to snap their own kid's photos! These frames were located in the Elementary GYM! Thank you to Darla Ludvigson for this great idea! 2014-15 Fundraiser ends in high note! 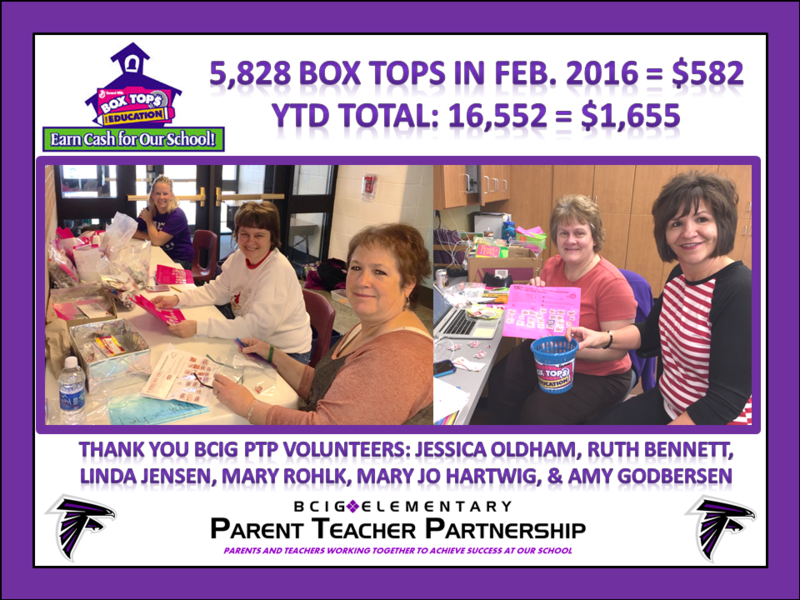 The 2014-2015 BCIG PTP Fundraising Goal was $5,000. During the year we completed the following fundraisers, followed by how much profit was made. We beat our goal by $592!!! This is all an amazing way we can give back to our school. I wanted to send a BIG THANK YOU to everyone who participated in our PTP Spring Trash Bag Fundraiser! We appreciate all of the hard work and support from our students, parents, teachers & staff, and community members who helped make this fundraiser a success! We sold 479 trash bags and received $125 in donations for a PTP profit of $1,442.25. We did have to round up our fundraising order to the nearest case for each color trash bag. Our final order was 500 rolls (final profit will be $1,500). I have 21 extra trash bag rolls available for $10 each - 10 qty. white, 6 qty. yellow, and 5 qty. blue. Please contact me if you are interested. Congratulations to the top 3 classrooms who sold the most trash bags: Steil (48 rolls), Snyder (45 rolls), and Warnke (38 rolls). These teachers will receive ice cream sandwiches for their entire class next Friday courtesy of the PTP. 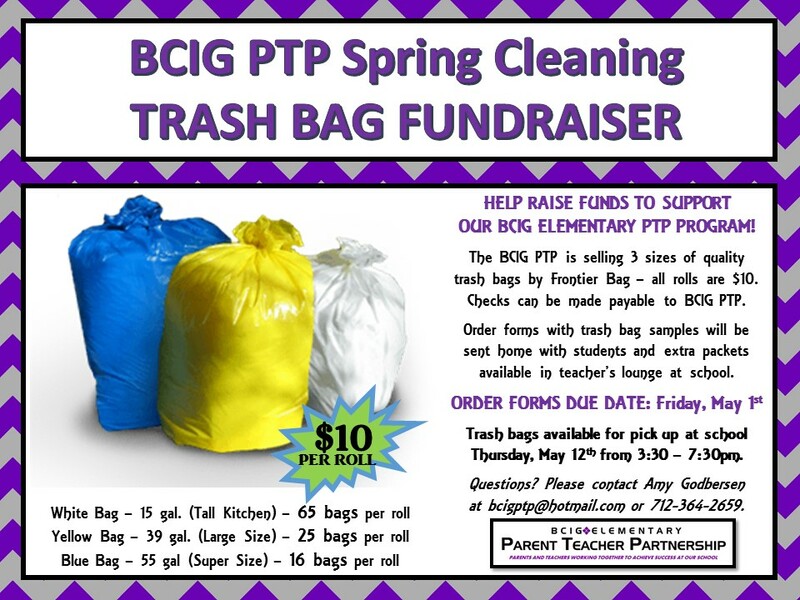 The trash bags will be available for student pick up next Tuesday, May 12th between 3:30 and 7:30pm at BCIG Elementary. Parents can pull up to the front of the school and we will have helpers that can load the bags/boxes into your car. We do need a few more PTP helpers next Tuesday if you are able to help for part of this time - please let me know! Thank you again for your support with this fundraiser and I hope everyone has a fantastic day! GO FALCONS! Thank you so much for supplying supper Tues. & Thurs. nights. It was the perfect amount and very, very yummy! Those 2 twelve hour days are long but knowing awesome food is in the lounge is a huge bright spot!We are very appreciative of the time and cost of this. Thank you all SO very much!! Have a great long weekend! BCIG Elementary (Kelly Young) A special thank you to the following volunteers who brought in food for Tuesday & Thursday's meals: Sarah Harm, Megan Ackerman, Brandi Sharkey, Amy Godbersen, Julie Weeda, Lori Hamann, Christin Devine, Karen Gunderson, Tammie Dausel, Stacy Segebart, Kayla Baker, Tashia Uken, Chandra Bender, Megan Nicholson, Lia Clausen, Danika Hinkeldey, Lisa Hofmeister, Jaci Nichols, Maggie Buns, Shelly Spotts, Jenn Bower, and Jodi Lansink. Thank you to our PTP group for purchasing & donating the Subway party subs for conferences and thank you to Jeanette Todd for picking these up and bringing them to the elementary school. If you brought a dish/tray/crockpot to school please pick up your item in the teachers lounge next week since there is no school today! Thank you again for all of your help and I hope everyone has a fabulous weekend! GO FALCONS! Approximate number of students in attendance: 238 (62%)!! 64 PTP & middle school/high school volunteers who worked the event: set-up, food, childcare, passport stations, & clean-up. 4 outside organizations who participated in our event: Iowa Extension Office (Healthy Snacks for Kids Station), Ida County Conservation Center (Live Mouse & Habitat), OABCIG High School Students (Science Station), and Ida County Cattleman (Hamburger Grilling). 1 live mouse donated by the BCIG PTP to the Conservation Center in honor of our students reading the Mouse & The Motorcycle book. Students voted on the name and this will be announced by Mr. Henderson tomorrow. Thanks to Bethany Jones for coordinating the mouse! Numerous compliments about the event including our awesome Mouse Stations & Centers! 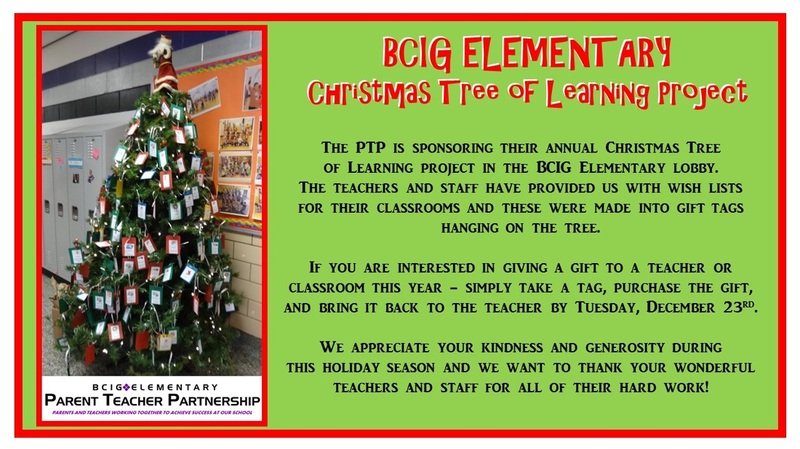 The PTP held their annual Christmas Tree of Learning project. BCIG teachers placed gift tags on the tree for children to choose. The children and their families then purchased the item written on the tag, and then delivered the gifts to the teachers before Christmas holiday break. It was a wonderful way for the kids to participate in gift giving, and for teachers to receive items for their classrooms. Some gifts included bags of candy, boxed board games, markers, gift certificates for online music, gift certificates to local retailers, and SO much more! Our teachers were so very thankful to have these great gifts before the holiday break. I am happy to report that the PTP Gold Canyon Candle Fundraiser was a big success! THANK YOU to everyone who participated in this fundraiser by selling a candle, buying a candle, or making a donation to the PTP. 100% of the proceeds from this fundraiser will benefit Family Fun Night at BCIG Elementary in February 2015. We sold 77 candles and made a profit of $725 for the BCIG PTP! A BIG THANKS to Sarah Lundy for her hard work in promoting and selling these candles. She also donated part of her commission back to the PTP - thank you Sarah! We held a raffle drawing for those who turned in a completed order form. Sarah Harm was the winner and she will receive $15 in Chamber Bucks. Thanks again for supporting the BCIG PTP and GO FALCONS! The BCIG PTP once again setup a baked goods table at the Parent-Teacher Conferences. Members bake yummy items, and we sell them to families and teachers as they come and go from their conferences. We also this year had an amazing donation of a water cooler and water from Mumm Soft Water (based out of Ida Grove). This allowed staff, students, and families to enjoy a cool glass of water while waiting for their conferences. Also during this week, members get together and create wonderful meals for the teachers to enjoy during their breaks. The PTP sets everything up in the teacher's lounge, and they are able to come and go as they please without having to worry about bringing food in or finding something to eat while having breaks between conferences. TEACHER CONFERENCE MEALS - there were so many compliments from the teachers for the meals on Tuesday & Thursday nights - great job everyone! Thank you Julie Weeda, Megan Zimmerman, Christin Devine, Julie Godbersen, Kayla Baker, Maggie Buns, Traci VanHouten, Becky Veltri, Tashia Uken, Tammie Dausel, Sarah Lundy, Chandra Bender, Stacy Segebart, Lia Clausen, Jennifer Bowers, Danika Hinkeldey, Kelly Rohlk, Karen Gunderson, Heidi Beck, Megan Ackerman, Lisa Hofmeister, Brandi Sharkey, Lori Hamann, Kristy Gilbert, Megan Nicholson, Jodi Lansink, Shelly Spotts, Heather Culley, Jeanette Todd, Sabrina Mailey, and Amy Godbersen. PTP BAKE SALE - We raised $350 at our PTP Bake Sale over 2 days which is fantastic! Thank you Lisa Hofmeister, Stacy Segebart, Julie Godbersen, Megan Nicholson, Jeanette Todd, Shelly Spotts, Kristy Gilbert, Sabrina Mailey, Jaci Nichols, and Amy Godbersen. "I again want to thank PTP for everything you guys do throughout the year. It is so unbelievable the support you give us!! It makes us feel so appreciated! THANKS - Mrs. Ehrig"
"Thank you SO much for the dinners you have provided during parent/teacher conferences. You guys rock! - Jen Quest"
"Thank you Amy and PTP volunteers for all the food for our conferences! The food was delicious Tuesday night and we really appreciate you providing meals for both nights. We are so lucky to have the PTP. You all do so much for the school and teachers. Thank you so much!! - Mrs. Freese"
The PTP did a great job supporting the book fair this year! We helped setup and tear down the event. This event happens during the P-T conference week. The school library turns into an amazing book fair where families can go and pick out their favorite books and items to use at home. This book fair then generates fundraising for the school. Thank you Jennifer Jordan & her boys, Jaci Nichols, Julie Godbersen, Ruth Bennett, Kelly Hewitt, Maggie Buns, Heather Culley, and Amy Godbersen. 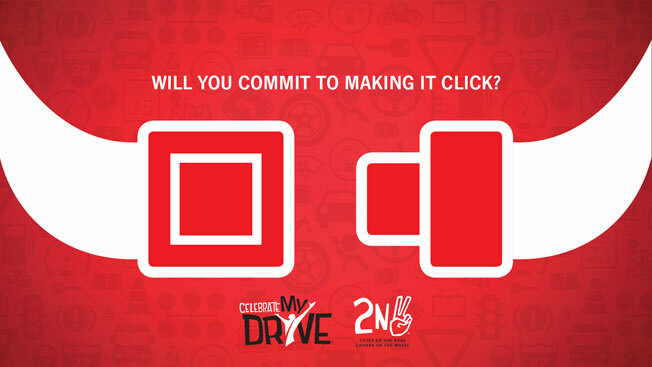 The OA-BCIG High School was entered into a contest regarding safe driving techniques. Even though we are technically the Elementary PTP, we stepped up and volunteered to help them win! For a week volunteers took their time to sit and enter names and email addresses into the contest form. The PTP entered 500 entries for 9 days... AWESOME! Thank you Renee Mason, Jamie Corbin, Bethany Jones, Jodi Lansink, Kristy Gilbert, Julie Godbersen, and Amy Godbersen. The BCIG PTP Spirit Table was a huge success at the Homecoming football game. WE RAISED $544 FOR THE BCIG PTP!! We featured an amazing selection of baked goods, bam-bams, glow sticks, pom-poms, beads, spirit cones, purple mustaches, body art, tattoos, and more. 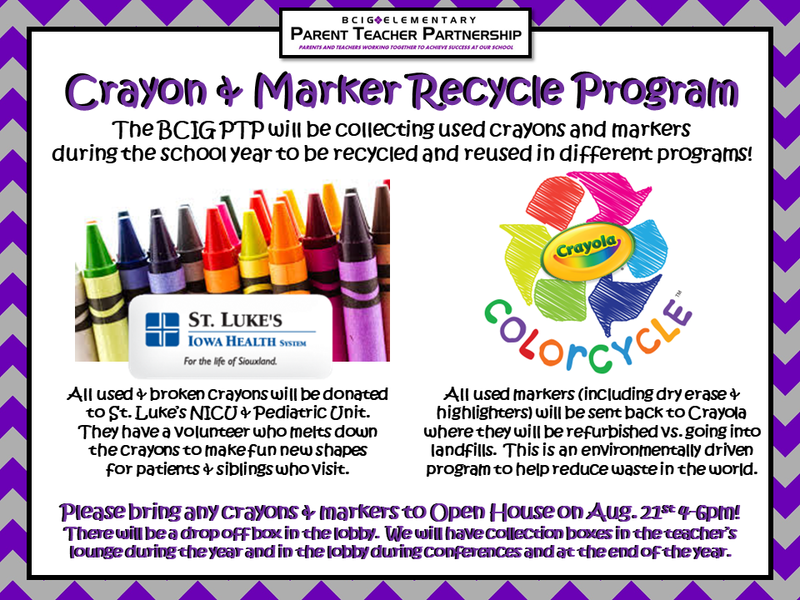 Before the start of the school year, BCIG Elementary hosts an open house where parents, students, and teachers can all meet before the first day of school. Parents get the chance to visit with staff. Children have the opportunity to meet their teacher, see their classroom, and bring all of their school supplies, making the first day of school a bit easier on them! 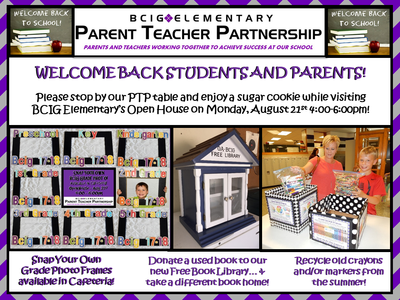 The PTP has a table setup where we offer cookies and punch to all incoming students and their families. This is also our time to allow parents a chance to meet our organization, as well as for them to sign up to be a part of the PTP. This is always a fun way for everyone to get to know each other.